Wind turbines north of Fifthian, Illinois on Wednesday, July 24, 2013. 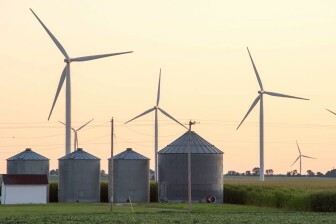 The University of Illinois will start buying its energy from an Illinois wind farm, increasing its percentage of clean energy use from about 2 percent to 9 percent, according to a news release from the university. The new 10-year agreement, announced by the UI this week, will supply the Urbana campus with 25,000 MWh of energy, about 8.6 percent of the total generation from the Rail Splitter Wind Farm. The Rail Splitter Wind Farm is a 67-turbine farm near Lincoln, Illinois, constructed in 2008 for about $200 million. The farm is owned by EDP Renewables North America, which runs five windfarms in the state, worth about $1.5 billion. Since it began operating in 2009, the farm generates 100.5 MW of energy, which is enough to power 35,000 households and is the equivalent of taking 45,000 cars off the road. At 8.6 percent of the total generation, the university’s share is equivalent of taking 3,870 cars off the road. The university has pledged to obtain at least 120,000 MWh per year from low-carbon sources by FY20, which is about four times the amount of clean the university will use annually, even after this purchase. The UI’s other share of clean energy is through its Solar Farm south of campus, which generates 7,863 MWh per year. According to the release, the campus has reduced its energy consumption by 28 percent since 2008 through upgrades and conservation efforts. “Obtaining wind power on this scale is a tremendous next step in diversifying and optimizing the university’s energy portfolio to meet future campus demand for more than 54,000 students, faculty, and staff. This long-term contract for low-carbon energy produced in Illinois reinforces the university’s commitment to achieving sustainability goals and developing partnerships for statewide economic development,” said Kent Reifsteck, director of utilities and energy services, in the release.